Playing basketball makes you look coolers; however, you need to have the right attire to make sure that you are always comfortable in the game. Shorts are one of the most important things to give your 100 percent to the game. A good pair of shorts will help you play like a champion. The right shorts will go a long way in giving you an awesome performance. There are a lot of shorts, but to support you better, you should consider some factors to ensure that they are the best ones. Here, I will recommend some pairs of best basketball shorts for men. The champion men’s long mesh short with pockets came with about 28 different color choices. These colors are youthful and fashionable. Its sizes are ranged from small to large to fit all kinds of body shapes. In terms of style, this pair of shorts will not make you disappointed. They are not too long or too short, but knee length to support you when playing sports. these shorts are made from 100 percent of polyester, so of course, it’s lightweight and breathable. You will not feel sweaty, even when you play sports for the whole day. They feature a logo at the left hem as a highlight point. Besides, the champion shorts have elastic waistband and internal quick cord for adjustability. These shorts are very convenient for wearing with the side pockets to keep your belongings. If you want to play sports, but you still want your essentials such as smart phone, key, cash, and so on with you, this pair of shorts is perfect for you. Moreover, these shorts are suitable for any occasions, such as outdoor or indoor activities. The next pair of shorts are not various in colors as the first pairs, but I think they are enough for us. The length of these shorts is the same as the above, which is knee length. This length is ideal for playing sports. You will never feel uncomfortable when moving much. The Russell white basketball shorts are made of 100 percent cationic polyester and its lining is made from 100 percent polyester. These shorts can be washed by machine or hand. Besides, the Russell shorts are covered by a mesh layer, which is responsible for keeping you breathable and airy. You will not feel too sweaty when playing sports. Addition to this, the Russel shorts are applied the Dri – power moisture wicking technology to keep you cool and dry. This pair of shorts consists of an elastic waistband with an internal draw cord for an adjustable fit. 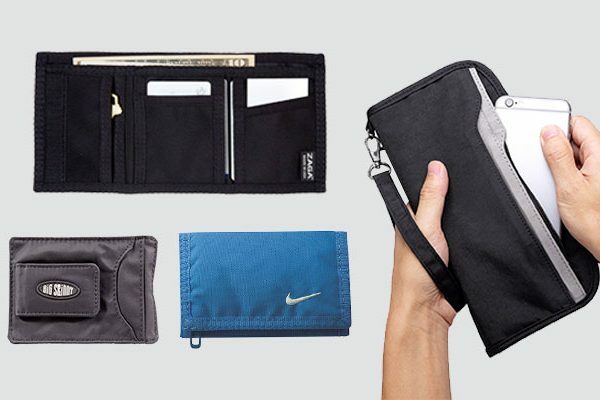 There are some side pockets for storing all of our small essentials. Similarly, you can wear these shorts to take part in any activities you want. If you are afraid of harmful sun rays when taking part in outdoor activities, these shorts are right for you. They have UPF 30+ to protect our skin from those harmful rays. This knee length pair of shorts is awesome in both design and style. It is made from 100 percent of polyester. This material is known as a lightweight and comfortable one. If these shorts are too loose for you, there is a fuller cut for complete comfort. The material enables to wick sweat as well as dry very fast to bring you the comfort. I like this pair of shorts because of its 4 way stretch construction. I never feel tight when I move because of this construction. It helps me move better in every direction. Plus, this pair of shorts owns mesh hand pockets to hold small items. These shorts have no liner, but they have an elastic waistband with internal drawcord to adjust as you want. These shorts can be used in many cases, it’s up to you. 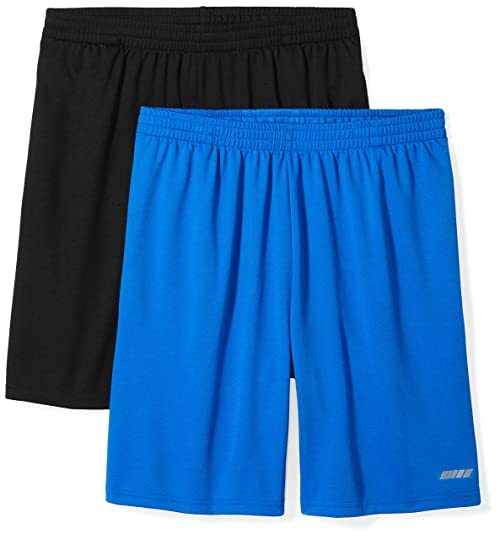 The Amazon essential shorts come with a pack, including both loose and fit performance shorts. And these pairs of shorts have different colors, so you can change whenever you want. 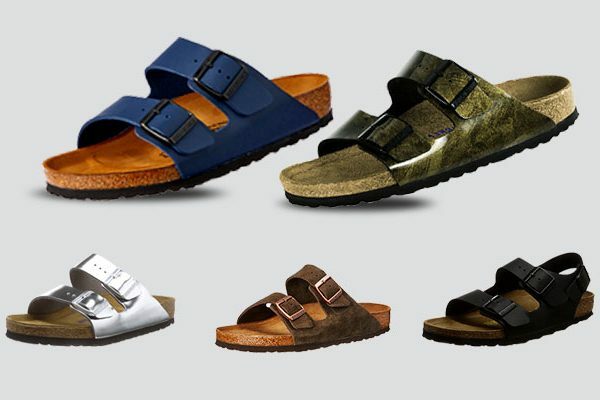 There are 5 pairs to fit your preference. 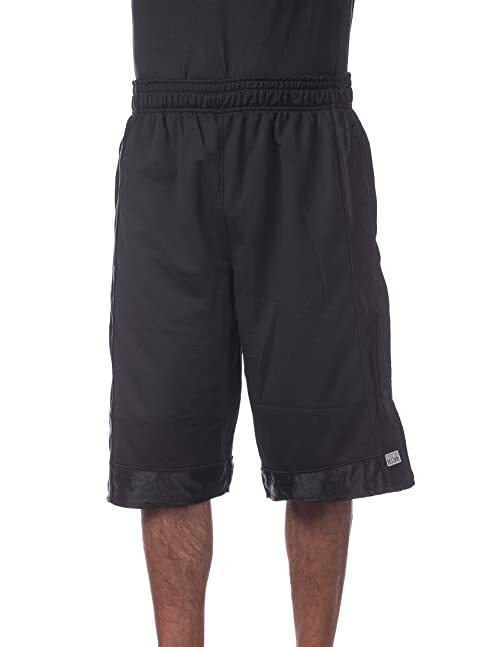 All of these black basketball shorts are made from 100 percent of polyester to bring you the quality, fit and comfort. These shorts are a bit shorter than the above ones, but they have their own wonderful features of shorter shorts. The loose fit is designed for all day comfort as well as a full range of motion. This pack consists of two lightweight shorts, which are quick dry, moisture wicking, and closed hole mesh. Besides, it is added an internal drawcord to adjust and a reflective logo to keep you safe under the low light condition. With these shorts, you can enjoy your sports more without uncomfortable feeling. If you are looking for the best quality shorts, but you don’t want to spend much time on finding, you should take this pack into the consideration. This pack comes with 5 different colored shorts. I believe that these shorts will meet up your needs. The shorts in this pack can provide you all features you need for a pair of sport shorts. It applied the moisture wicking technology to keep you always dry and cool. Furthermore, its breathable construction offers greater ventilation to help release the moisture away from your body. The inseam provides the comfortable coverage and a full range of motion. There is an elastic waistband with adjustable internal drawstring to deliver a custom fit and feel that is not too tight, but stay on your waist well when you move around. You also can bring small essentials with you when wearing these shorts with side seam pockets. These shorts are perfect for workouts, playing sports, exercise training, hiking, or boxing. The next pair of shorts belongs to Adidas brand, which is famous for high quality sport clothes and shoes. And this pair of shorts is no exception. The Adidas knee length shorts have a good quality to bring you the best comfort. If possible, you should collect some Adidas shorts because their quality is top notch. 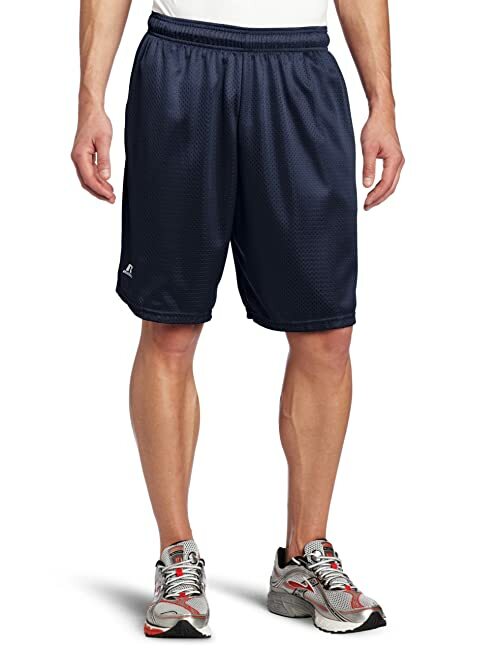 This pair of Adidas mens basketball shorts is made of 100 percent of polyester interlock. This is one of the most favorite materials for shorts because of its lightweight and comfort. Additionally, these shorts can sweep the sweat away from our skin. Besides, this pair of shorts is quite convenient with the side pockets for storage and drawcord on elastic waist to adjust to fit your waist. These knee length shorts can be worn for any occasions, such as playing sports, cycling, hiking or running. CYZ shorts come with a pack of two shorts. These shorts are very convenient with different color choices. 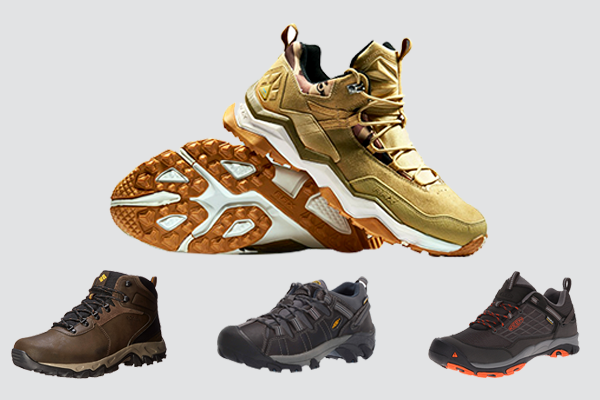 If you do not want to buy a pair, you also can select one. 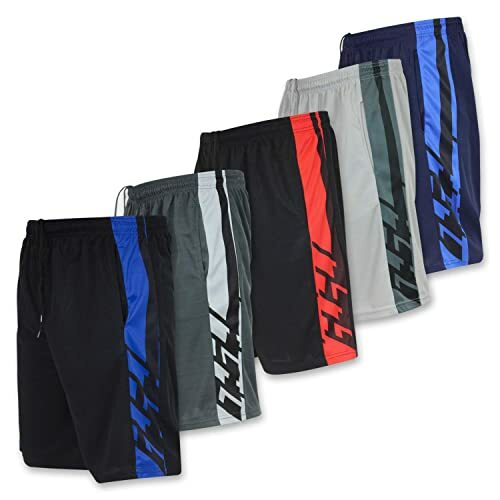 The CYZ shorts have an eye-catching design with a reasonable length. Besides, they are made from a fabric blend which enables to wick moisture away from your skin to keep you cool and dry all the time. Moreover, the premium polyester fabric can promote the quick drying and breathability. These shorts have an elastic waist with an internal drawcord for adjusting. Each side has mesh pockets to store small items with you while you are playing. 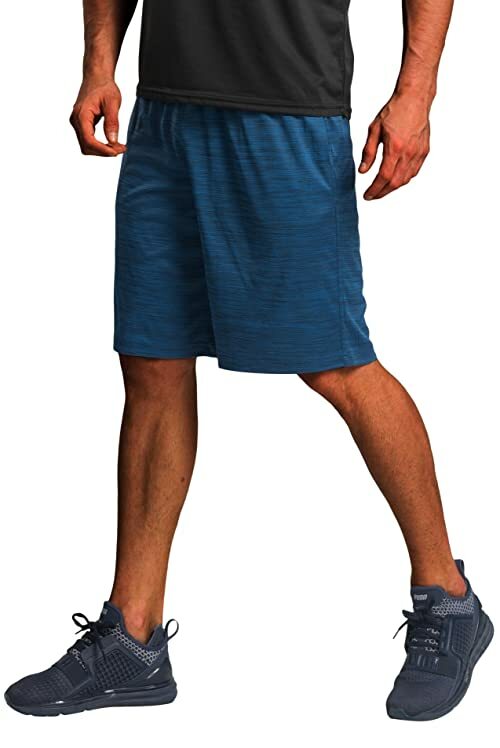 This lightweight versatile athletic short can be used as basketball shorts, running shorts, gym shorts, and workout shorts. If you are looking for comfortable shorts, you should not ignore the Choice Apparel Mens two tone training or basketball shorts. In terms of size, these shorts are ranged from s up to 4XL to fit all men. These shorts are made from polyester; therefore, they have all good features such as lightweight, breathable, and comfortable. The Choice Apparel men’s shorts are made of high-quality material, so they will be not sweaty or smelly. The most special feature of these shorts is the stylish design. It is the combination of 2 different colors. Like mine, the black and white are mixed, but the main color is black, while the white color is used for the lines. These shorts have an adjustable elastic waistband and functional drawstring, but not too tight. The Gerlobal men’s bodybuilding gym shorts are designed for men who want to show off their muscle. You will look more masculine with these shorts. These shorts are plain, but quite impressive. 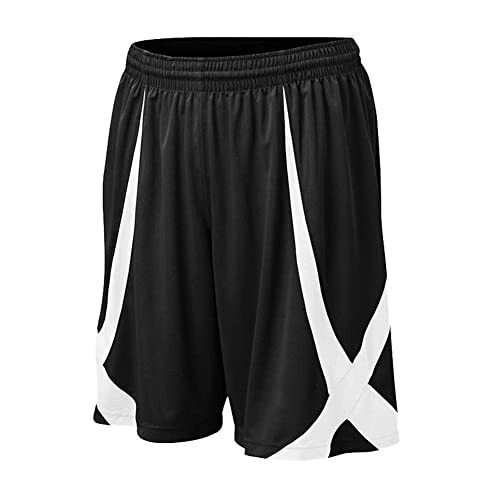 These youth basketball shorts feature breathable, ultra-lightweight, and durable. I discovered that these shorts have smooth chafe free flatlock seam construction to provide a full range of motion without chaffing. The pockets are deep enough to protect our cell phone, or MP3 player from falling out when we do exercises. These Gerlobal shorts are ideal for workouts, biking, fitness, running, yoga or any other activities. Besides, you also wear them every day. Overall, these shorts are stretchy, soft, and durable, which can keep you stay dry and comfortable. 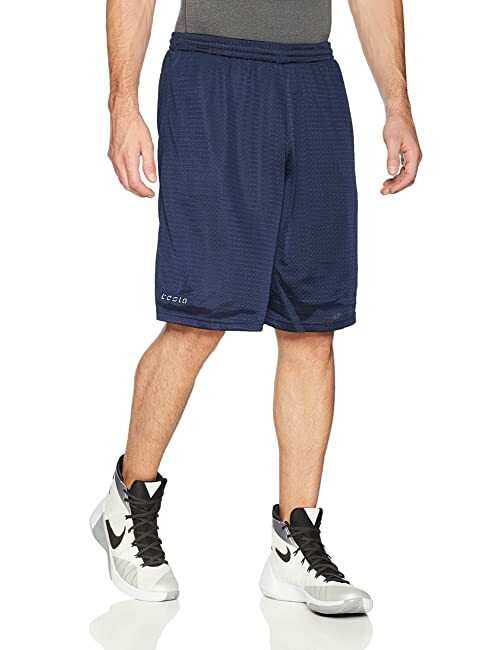 With regard of style, these nike elite basketball shorts are not the most fashionable shorts on this list; however, they are one of the most comfortable shorts. They do not vary in colors, but enough to choose. 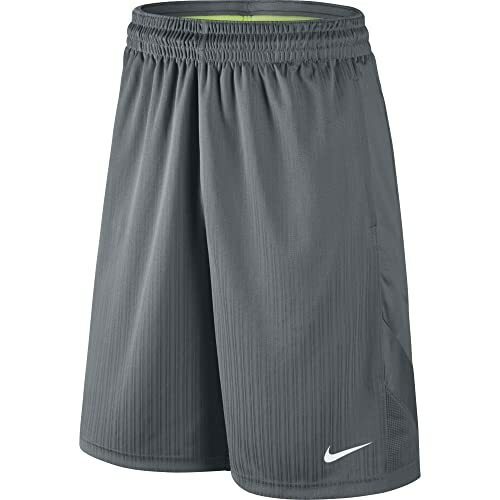 These Nike men’s Layup 2 shorts are made of 100 percent polyester with the pinstripe design knit into fabric. For a secure fit, they have an elastic waistband with an internal drawcord for personalized. Nike brand always release good quality items and these shorts are not an exception. They have pockets on side seam for convenient storage. These Nike shorts are a perfect choice for sport lovers or casual wear. If you wear uncomfortable shorts to work out or play sports, you will be sweaty and can’t move as you expect; therefore, it is very important to opt for suitable shorts. And Pro club men’s heavyweight mesh basketball shorts are a good suggestion. These shorts are also made from polyester, so of course, they are light, durable, and breathable. Besides, the Pro Club shorts have a mesh layer, which is used to promote the breathability to keep you cool. These Pro Club shorts own some convenient zipper pockets to keep your belongings. 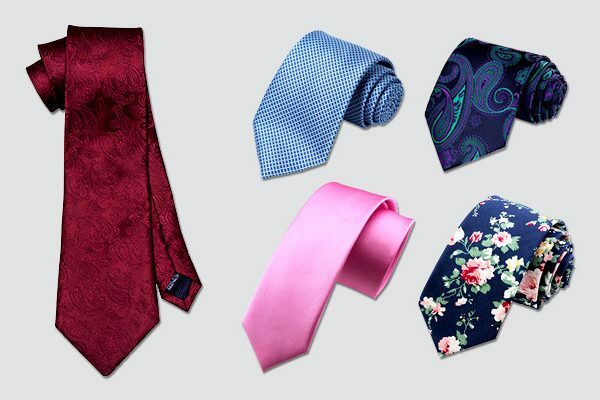 They are various in colors and trendy in style. You can take the use of these shorts for all activities. 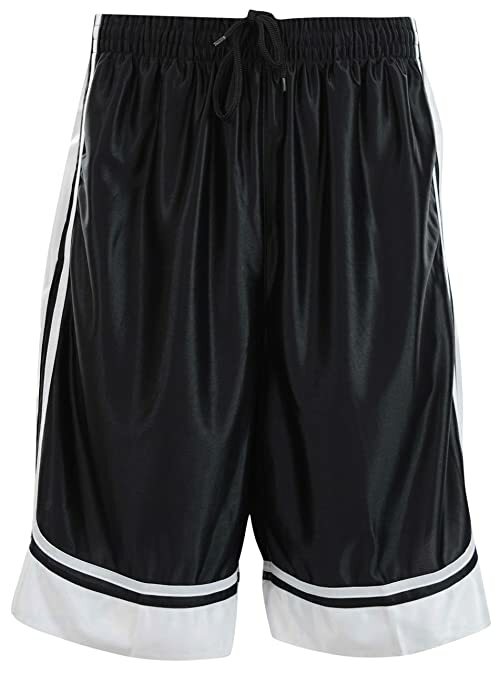 Boys basketball shorts are always available in various colors from light to dark colors to be suitable for all people. These Tesla shorts are quite good. 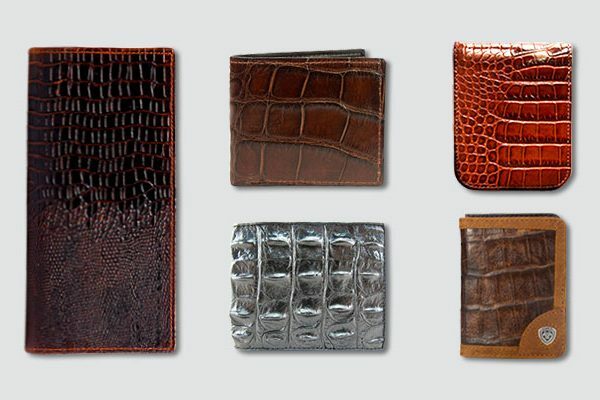 Because they are made of functional fabric and polyester, so it is very soft to touch. Moreover, these shorts are extremely light to support your movements. Besides, the manufacturer added a mesh layer, which is not only soft but also smooth to wick away the moisture and dry quickly. Thanks to two-way air ventilation, you will never feel hot or sweaty when playing sports. There remain some deep side pockets for storage. These shorts are safe for our skin, which enables to protect us from the ultraviolet rays. Top tie men’s basketball shorts are one of the most favorite shorts for men on the market up to now. 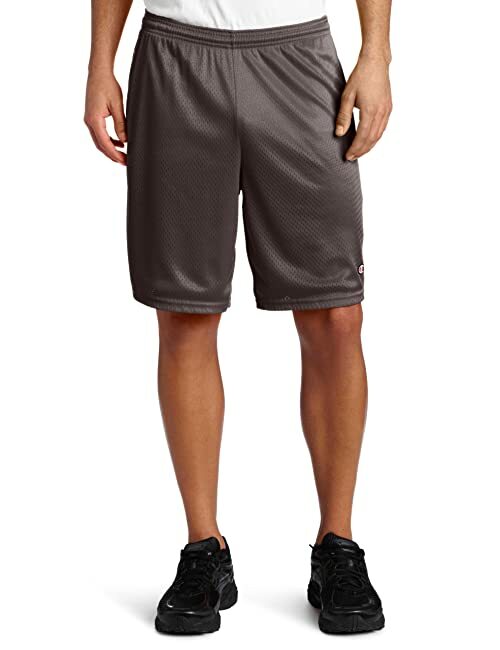 These basketball shorts are made of 100 percent of viscose knit polyester to bring us the comfort and durability. 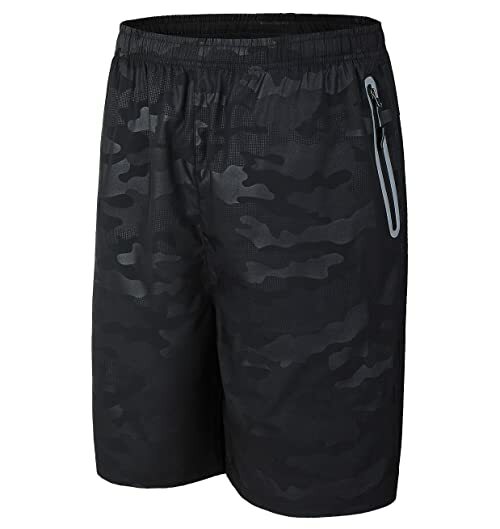 Apart from comfort and durability, these shorts feature high moisture wicking to allow for free air circulation during doing activities, such as playing sports or workouts. When wearing these shorts, you will always feel cool and dry. The fabric is both loose and light to move more freely. The design of these shorts is unique with contrast piping two colors. There is a durable waistband with an internal drawstring and a white lining that we cannot see through. In terms of size, these top tie shorts can meet up all your requirements. Last but not least, the Gititlys mens gym shorts for men have a good quality and unique design. These shorts are not completely made of polyester, but they are added a bit spandex to make the shorts lighter and more breathable. If you need to hold some small things like key or cash, these shorts can meet you up with two side pockets. These shorts are very comfortable with the fuller cut as well as convenient with the zipper pockets and elastic waist band. This pair of shorts for men is ultimate in comfort and staying cool. The Gititlys shorts are a good selection for daily wear, or outdoor activities. It can be worn for outdoor sports, gym activities or the beach. Shorts are available in many different styles on the market. But, if you want to enjoy your game more, it is better to opt for the shorts that keep you cool, comfortable and dry. You can refer to this list whenever you intend to buy. Hope it’s helpful!